Everything seems to be working OK, but there’s a red circle with a cross in it next to ACF when ACFW is activated. Deactivating other plugins doesn’t seem to help. Anything I can do to help track this down? Hey hugh, thay looks like the notice that’s associated with a missing license key. Is yours still active and present on the settings screen? Functionality wise, you have nothing to worry about. Daron, yes, the key is still active and present on the Settings screen. As is my ACF 5 licence key. Strange. This seems to have been a recent change. Anything else I should look for? Hmm. There hasn’t been an update to the plugin since mid-late August ( because no bugs? 😀 ) so nothing should have changed. My dev environments aren’t showing anything abnormal either. Is there a setup that has changed on your end within the last few days perhaps? I’m totally happy to fix plugin conflicts if I can but I need a place to start looking first! …actually Hugh, after looking up your account here on the site to see if how many activations you have remaining, this site is reporting that you don’t have any site active currently. Is this on a production site somewhere or your local machine? Thanks for your help troubleshooting. I really appreciate it! Yes, it’s on a development site, on my shared hosting service. So I shouldn’t get too excited until the site goes live at its own domain? Probably not. 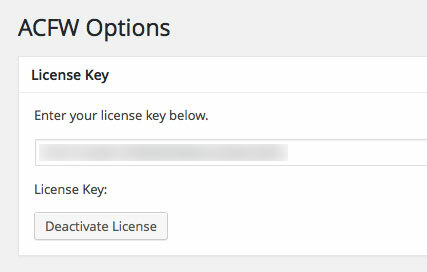 On the “ACFW Options” settings page, what is the status located beneath the license key field? I was thinking about redoing the notification anyway because it’s not quite 100% “the WordPress way” so that may fix the issue you’re experiencing as well if that’s the case. This is what I see. No status notification as such, unless it’s implied by the ‘Deactivate’ button. Hmm nope that’s not normal. There should be some sort of status code there after “License Key:”, even if it’s deactivated or missing. Definitely something fishy going on with your license. Can you try deactivating it, deleting it, and then re-entering your key again? If that doesn’t work, you can try going into wp-admin/options.php and deleting the license key from there. No change with deleting and restoring the licence key via the Settings panel, but you could be onto something with the PHP version. Dreamhost recently updated PHP to 5.6 — which is what this dev site is running on. Just a note to say I couldn’t spot the licence key in wp-admin/options.php. Hmmm if there were PHP version that could cause issues they would be older versions. Since it is on a dev server, would you be comfortable providing me the URL and login information for an admin account to let me take a look at it? If that’s ok, you can click the “set as private reply” checkbox below the reply form and only you and I will be able to see it. Heya Hugh. I think I figured out the problem. I installed Query Monitor (fantastic plugin if you haven’t used it!) and checked the ACFW Options page and immediately saw there was a failed HTTP request to the ACFW server. I did some googling and found this note on Pippin’s site. Since you aren’t using a security plugin (from what I can see) it might be your host. I would double check with them (or try deactivating any security plugins) and see what happens. Since ACFW can’t verify your license, it’s trying to show you a notice, but it doesn’t know what notice to show since the license key doesn’t have a status. So yea. Let me know if that stuff helps you at all. Hopefully it does! OK, I think I’m rapidly getting out of my depth here. How should I ask my host about this? Is it along the lines of what Dinesh Karki says in the thread you linked to? That the host may have security enabled that blocks API calls with a URL in the $_GET parameter? 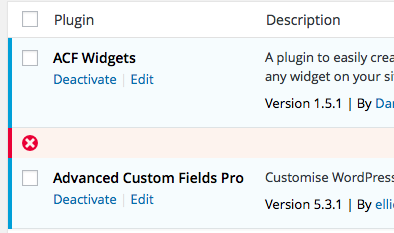 BTW, you’re right that there’s currently no extra security plugin enabled. And the .htaccess file looks pretty standard. Yes, essentially, that’s what I think is happening. Give your host a ring and see what you can find out. Send them that forum thread and they should be able to help you out. If you can’t get a straight answer out of them, let me know. I’m friends with someone from Dreamhost and they have a few people actively involved in the WP community.